Russell Wilson could break multiple taboos and thrash quite a few tired tropes with a victory in the Super Bowl this Sunday. If you are a fan of the Denver Broncos more power to you. If you’re down with the Legion of Boom and the Seattle Seahawks, then put on your silver and blue, play some Macklemore—or Blue Scholars—and have a great Sunday. But let’s just say you happen to be somebody who has no rooting interest in the Super Bowl or, even better, are not a football fan but will find yourself at a Super Bowl party and want something to do other than rank the best commercials. Here is one reason to go all-in and root for the Seattle Seahawks. No, my one reason has nothing to do with Richard Sherman, although I bet his victory speech would be one for the ages. The reason to root for Seattle can be found behind center. And his name is Russell Wilson. My rule on these matters is simple: when you don’t have a rooting interest, stand with a squad on the basis of the conversations beyond football that they can provoke. Put simply, if Russell Wilson wins this game, then the most retrograde voices on sports radio, at the neighborhood bar and in social media will have to shut their mouths. If Russell Wilson holds the Lombardi Trophy amidst the swirling environs in New Jersey, here are some things we are never going to have to hear again. We are never going to have to hear that Doug Williams, way way back in 1988, remains the only quarterback of African descent to lead a team to Super Bowl victory. That tired line, usually said by an uncle after too many beers, will have to die. The second thing we will never have to hear again—and believe me, this cannot come soon enough—is the backward-looking concept that you can only win a Super Bowl if you have some dropback pocket passer with feet encased in mafia-grade cement like a Tom Brady, Joe Flacco or, oh, I don’t know, Peyton Manning. The scouting groupthink is that if you are Russell Wilson or Robert Griffin III or Colin Kaepernick, then your style of play, no matter how “entertaining,” will lead to inevitable failure. Being able to run is a nice bonus for a quarterback, but irrelevant when it’s time to win. What I hate about this conventional wisdom is that racism runs through it like a jagged scar people pretend not to see. There is certainly a strong argument that the scampering Steve Young should have put all of this to bed in 1995 when he threw six touchdowns and led the San Francisco 49ers to Super Bowl glory. Or even a player like Aaron Rodgers who led the Packers to victory in 2011 with mobility to spare. But no. The trope that mobile quarterbacks can’t win the big one lives on because all too often it is code for “mobile black quarterback” in the tradition of showstoppers from Randall Cunningham to Michael Vick. A generation of great college players like Jamelle Holieway, Brian Mitchell, Tony Rice and Tommie Frazier, to name only a few, never had a shot at playing quarterback in the NFL because, being mobile black quarterbacks, they did not fit the mold. What is so amazing about Russell Wilson—and I hope RG3 is taking notes—is that he absolutely is a “pocket passer,” only he redefines what we understand to be the “pocket.” Wilson scrambles and scurries every which way, but his eyes are downfield at all times. Then there’s the height thing. Russell Wilson stands at 5′ 10″ tall. If he wins, he becomes the first under-six-foot quarterback to lead a team to a Super Bowl victory. (Although I want to see true measurements on Drew Brees.) If Russell Wilson can make this happen in a copycat league, it opens up space for a lot of QBs who have the skills but don’t happen to look like Blaine Gabbert, one of a long list of 6′ 4″ first-round quarterback busts. 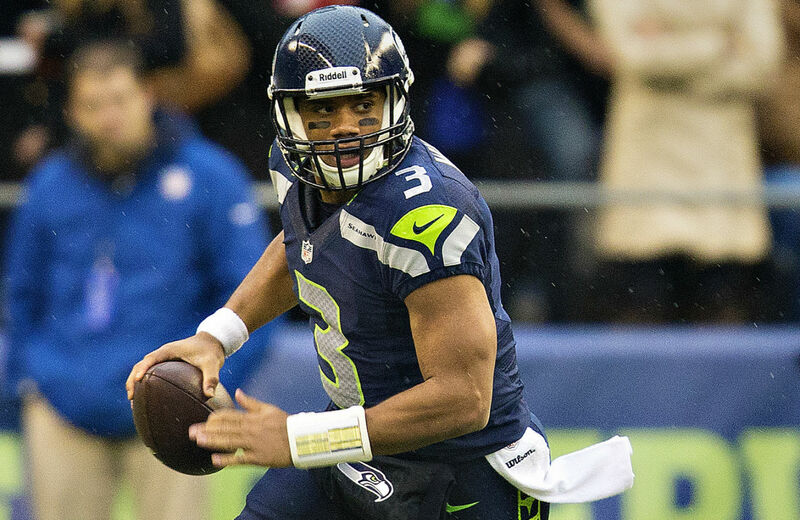 Russell Wilson was a third-round draft pick and the sixth quarterback taken in 2012. He was chosen by the Seahawks, even though they just gave a truckload of money to a free agent named Matt Flynn. Wilson was even picked one spot after the Jacksonville Jaguars (the team that drafted Gabbert) took a punter. Wilson was lightly regarded despite the fact that as a senior at Wisconsin, he led the Badgers to the Rose Bowl and set a single-season college football record for passing efficiency. Given how many teams sacrifice first-round draft picks on quarterbacks who miss as often as they hit, the ascendancy of Russell Wilson is also a living, breathing example of just how bereft of imagination and fearful twenty-first-century football scouting has become. For the scouts, Wilson just did not check enough of their precious 1970s boxes. Maybe if the Seahawks win, those boxes will change. And then there is the last reason to root for Russell Wilson. He really is, PR and fluff aside, someone you want to root for. His grandfather Harrison Wilson Junior is a legend in HBCU (historically black college and university) circles, based on his two-decade tenure as president of Norfolk State. Over twenty years of stewardship, Harrison Wilson increased the number of students enrolled in the Norfolk State graduate program by 600 percent and the school graduated more African-American teachers than any institution in the country. Wilson did this openly, proudly and defiantly in the years 1977–96, a time when HBCUs were under constant attack both financially and ideologically. His ability to have Norfolk State thrive in that era is revered and often mentioned in HBCU circles as a stirring display of excellence, despite doubters and pitfalls on all sides. Harrison Wilson Jr. was not supposed to achieve the way he did. All the metrics and trendlines were supposedly against him. Suddenly, Russell Wilson’s bold belief and cool confidence that he could, against all conventional wisdom, be an NFL star makes a hell of a lot more sense.